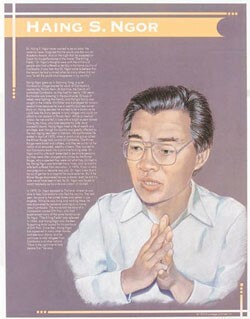 This educational poster features an original illustration of doctor and Academy Award-winning actor Haing S. Ngor, as well as biographical text about his life. 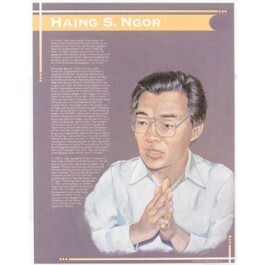 Haing Ngor was born in Cambodia in 1940. He became a successful doctor helping poor people in rural villages in his country. But that ended in 1975, when the Khmer Rouge took over his country. He suffered starvation and torture during this time and watched helplessly when his pregnant wife died. He escaped to the U.S. and got a role in a movie called "The Killing Fields." He won an Oscar for Best Supporting Actor for this role. Sadly, after surviving the killing fields of Cambodia, he was shot to death outside his home in Los Angeles, the apparent victim of a hold-up. But he lived long enough to, in his words: "tell the world what happened to my country." This poster is a great way to introduce students to an important Asian-American with a fascinating life story.